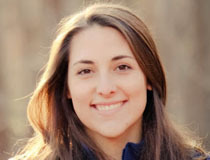 Alicia Cheripka ’18M has been announced as a finalist for the 2019 class of the John A. Knauss Marine Policy Fellowship program, one of the most distinguished of its kind in the nation. Since 1979, the National Oceanic and Atmospheric Administration and Sea Grant have provided one-year fellowships working in federal government offices in Washington, D.C. to more than 1,200 early-career professionals. Knauss finalists are chosen through a competitive process that includes several rounds of review at both the state Sea Grant program and national levels. This fall, the finalists will interview with several executive or legislative offices. Following placement, they will begin their fellowship in February 2019. A D.C. native, she will be choosing her host office in November and hopes to work with fisheries management. She is currently in a temporary position as a fisheries biologist at the NOAA lab in Beaufort, N.C. She completed her undergraduate studies at the University of South Carolina and was a member of the UNCW swim team. Preparing students for post-graduation success and increasing post-graduation career placement are key institutional goals, as outlined in UNCW’s Strategic Plan.